Today one of my work mates gave me four of her old skirts that she no longer uses. 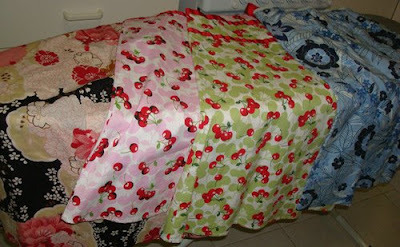 Love the fabrics and I am now setting out to make something funky for girls with them. I'll show you when i have made something. I will warn you though, please don't hold your breath as i am making stuff for Mathilda's Market in July. It's only 4 weeks to go and i am already stressing out - so much to do and so little time! Who doesn't love a cute cherry fabric?? PS - Look at you go "Blogger" Jen Melei!! What a pro. Lol, you always make me laugh Jen. Yes, who would have thought? See what happens when you persuade people at busy markets in Sydney on Friday evenings to start a blog! You have created a monster, there's no stopping me now, haha. I'm a bit jealous those skirts would make some cute adults Tshirts! I am starting to get worried.